Florida Governor Rick Scott signed today the Senate Bill 736 (SB 736) titled ‘The Student Success Act’ which implements part of Rick Scott’s 7-7-7 plan. This bill “will give Florida the best educated workforce to compete in the 21st century economy” by eliminating tenure and instituting merit pay, and will allow Florida to attract and retain the best teachers and “make sure that every classroom in Florida has a highly effective teacher,” Governor Scott said. 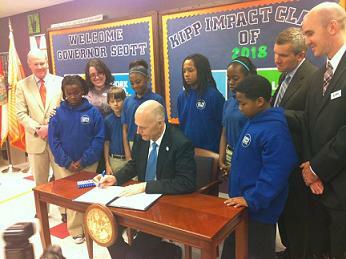 3/24/2011 Jacksonville, Fla. – Today, Governor Rick Scott signed Senate Bill 736, the Student Success Act, into law at the charter school, KIPP Impact Middle School in Jacksonville. The historic bill puts in place part of the Governor’s 7-7-7 Plan by requiring merit pay for Florida’s public educators based on student achievement. • Teachers will be evaluated using a scale of four levels for performance (highly effective, effective, needs improvement and unsatisfactory), instead of being evaluated as either satisfactory or unsatisfactory. In 2009, 99.7 percent of teachers earned a satisfactory evaluation. • At least half of an educator’s evaluation will be based on student learning gains for classroom teachers, 30 percent for non-classroom personnel and 40 percent for school administrators, instead of 100 percent of the evaluation being based on principal or peer review. • Teachers in hard-to-staff subject areas, like math and science, will earn more money, instead of paying all teachers – regardless of subject taught – using the same scale. • After July 1 of this year, new teachers will work on annual contracts, instead of receiving tenure after three years of satisfactory evaluations, which is essentially an employment contract for life.